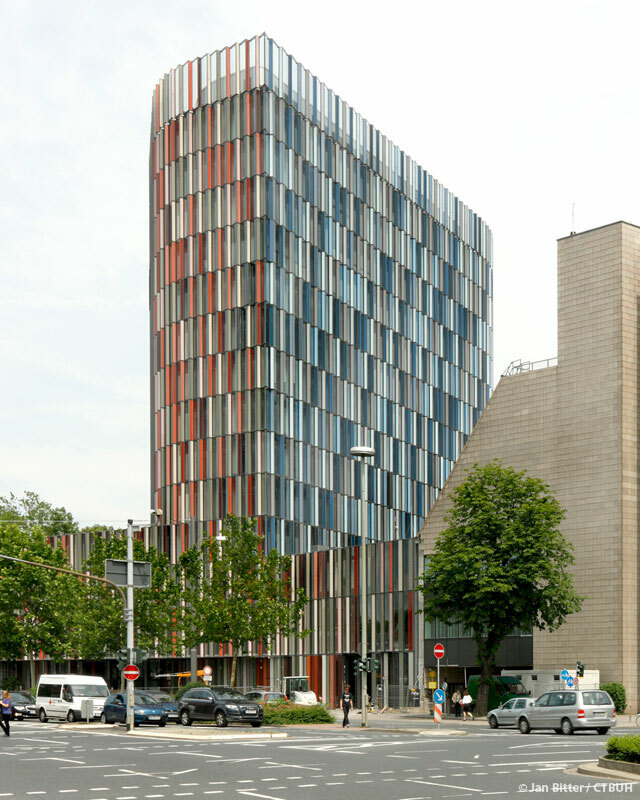 One of the first office towers in the world predicted to run on less than 90 KWh/m² of primary energy per year, KfW Westarkade uses approximately half the average energy of European office buildings, and one-third of American. The building forms a 14-story extension to the KfW’s headquarters in Frankfurt, completing an existing ensemble of buildings from the last four decades. Situated in the city’s West End, it lies adjacent to the Palmengarten park and includes space for conference facilities and 700 new workplaces. The streamlined shape of the tower integrates itself into the cluster of existing buildings. It acts as a colorful interface between two distinct urban spaces: while it appears as a slim slab towards the city, it presents a discreet backdrop to the park and provides open sightlines for the existing ensemble. Furthermore it exploits the prevailing wind direction for controlled natural ventilation of the offices by means of its unique double layered wind-pressurized façade. 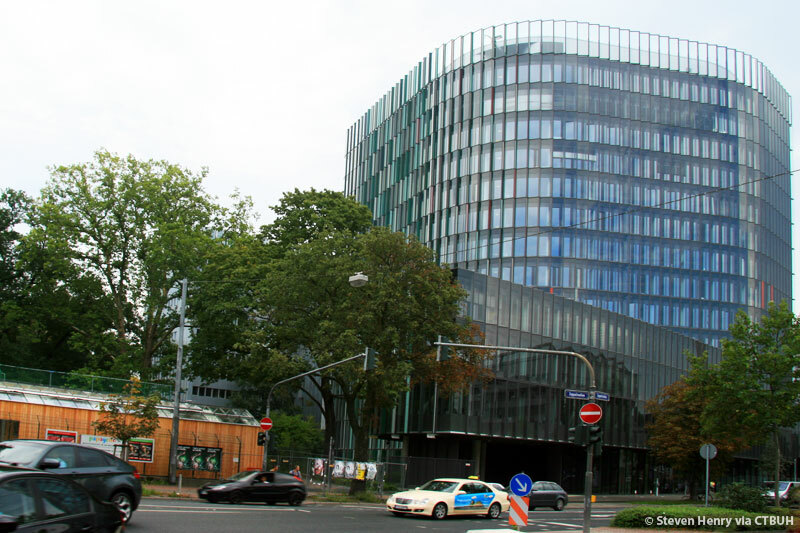 The new building extends the grounds of the KfW Banking Group to the west with a four-story podium that clearly delineates the edge of the Zeppelinallee road. The tower above it is formed in such a way that it does not obstruct the view from the existing office floors of the main building. Together with the main buildings and the adjacent existing structure, the building’s south side creates a communal courtyard. The landscaped areas of the southern end of the Palmengarten are drawn through the site leading to this courtyard, resulting in a coherent and interesting open space. The construction and use of the Westarkade is governed by numerous built and behavioral features to maximize sustainability, led by three factors: natural ventilation, activated slabs, and geothermal energy. The Westarkade had as its primary aim to make a significant advance in the field of natural ventilation of tall buildings, as a significant component of their overall sustainability. 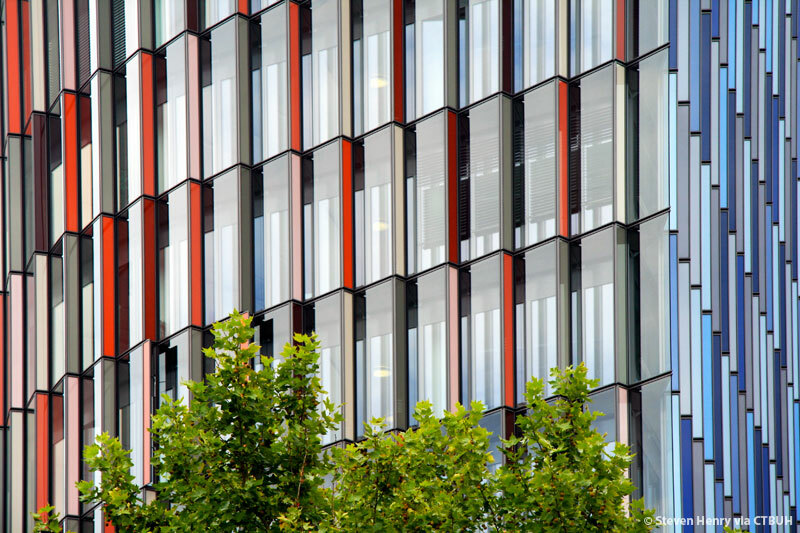 The dynamically-controlled pressure-ring façade serves to neutralize external wind conditions which are otherwise too turbulent for operable windows, especially on higher floors. The façade’s outer layer contains sensor-controlled flap openings that maintain a constant and even air pressure within the ring. The inner layer has operable windows that allow the offices within to be ventilated. The air flow within the pressure ring is regulated to never exceed 6 m/s. The flaps are designed to adjust to five wind directions as well as outside temperature, solar radiation and pressure differences on the windward and leeward sides of the building. Exhaust air flows through noise-attenuating overflow elements in the office partitions and along corridors until it reaches the cores, where the air, through stratification, is naturally driven upward to the roof through shafts. As a result, the offices can be ventilated naturally for eight months of the year without creating drafts or undesired heat loss. Mechanical ventilation is required for less than 50% of all working hours. The double façade also functions as a passive thermal solar collector, as the flow of fresh air is pre-tempered by solar radiation within the double façade. In this way heat loss is minimized and heat energy is conserved. 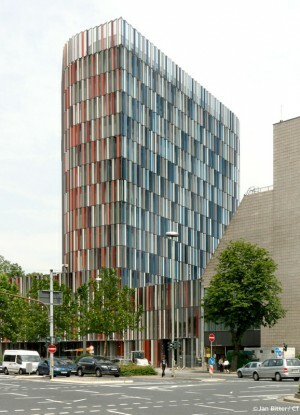 The outer skin of the double façade can be opened completely in order to avoid overheating of the building in summer. The building employs thermally activated slabs, whereby a system of pipes built into the solid floors conveys water that serves as both a heating and cooling medium. This creates exceedingly energy-efficient, comfortable and constant room temperatures. Due to the high thermal storage capacity of the solid concrete floors, the rooms can be sustainably heated and cooled without the extremes in water temperature that are required with traditional radiators. For this sort of tempering, energy can be used that already exists in the building: the waste heat from the data processing center can cover half of this heating demand. Geothermal energy is provided through an air source heat pump which complements the recovery-based heating system within the KfW complex. Largely contaminant-free air is drawn from the adjacent Palmengarten park, then tempered by traveling though a system of underground conduits before being distributed inside.